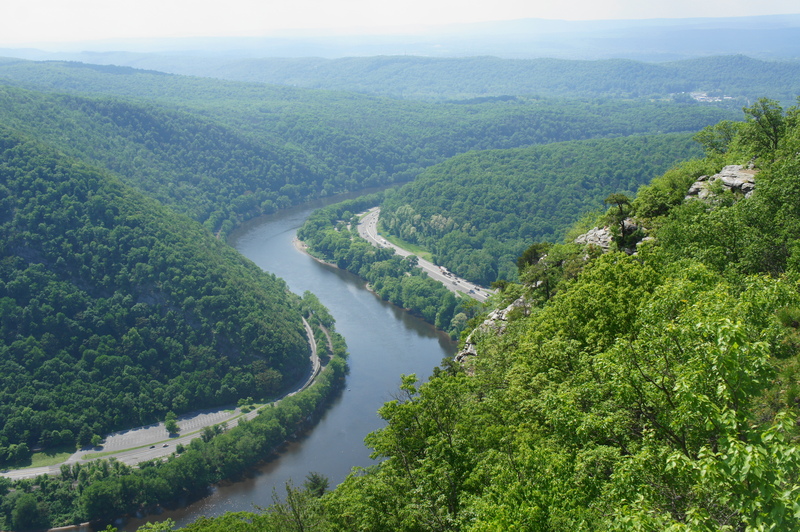 At the Delaware Water Gap, part of a broader National Recreation Area bearing its name, the Delaware River slices through a weakness in the mountains, forming a picturesque valley on the border of Pennsylvania and New Jersey. 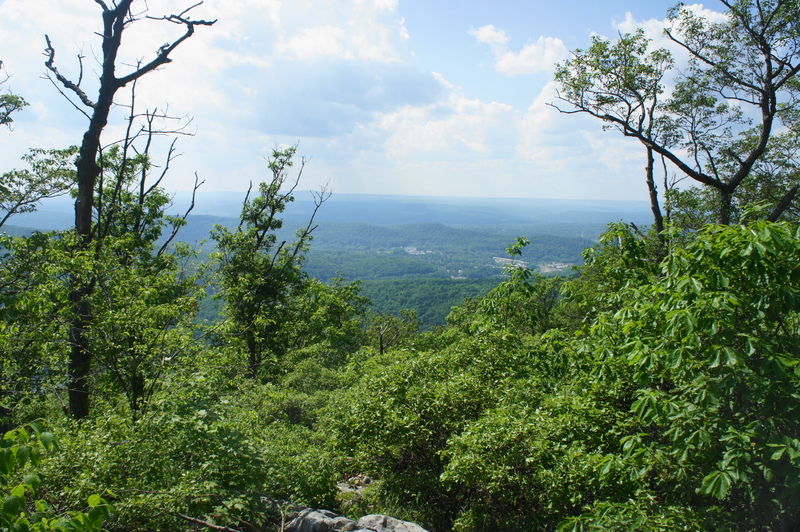 Two peaks, part of the broader Kittatinny Mountain, tower above the Gap: Mount Minsi (1,463’) on the Pennsylvania side and Mount Tammany (1,526’) in New Jersey. 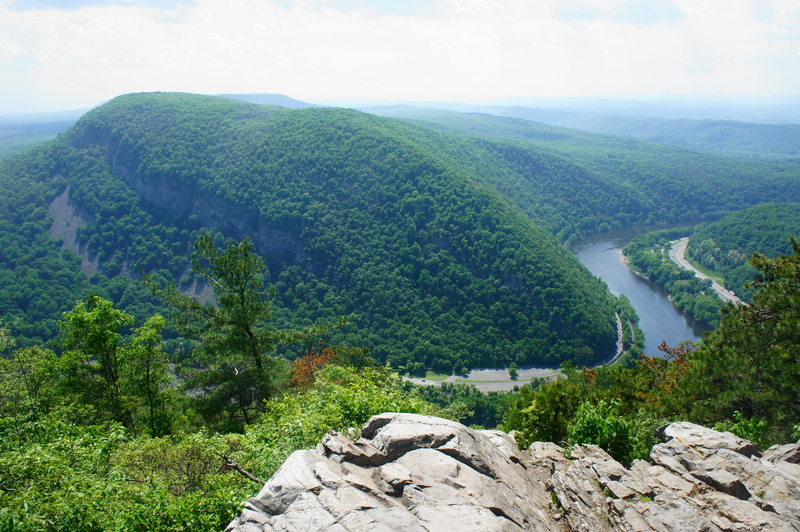 Both are accessed by strenuous but relatively short hikes, though Mount Tammany boasts the better views. The Red Dot-Blue Dot Trail circuit forms a fine half-day loop to and from the summit, likely one of the best hikes in New Jersey. The hike to Mount Tammany begins at the parking lot in Dunnfield Creek Natural Area, which is kind of a park inside a park (Worthington State Forest) inside a park (Delaware Water Gap National Recreation Area). Dunnfield Creek Natural Area is a less than half mile drive from the Kittatinny Point Visitor Center in the southern reaches of Delaware Water Gap National Recreation Area, just off busy Interstate 80 on the New Jersey side of the Delaware River. (Note: There is also a Red Dot Trailhead further east.) The parking area is large but likely to be nearly full on weekends and sunny days in the summer. 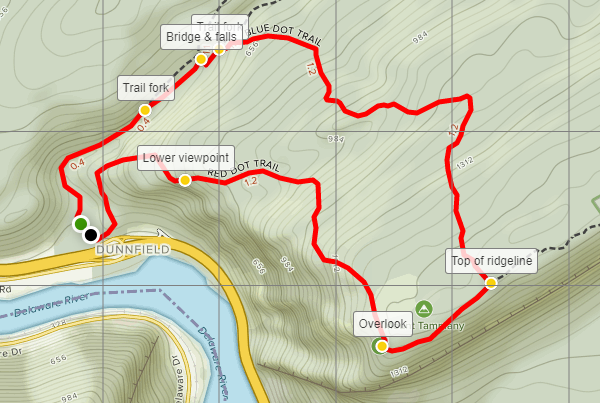 Two trails take off from here: the Red Dot Trail and the famed Appalachian Trail (AT). 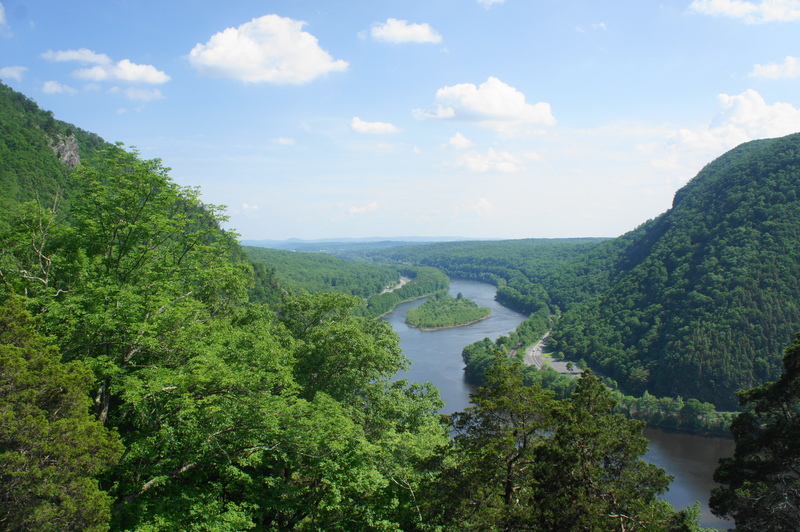 While most visitors to Mount Tammany climb the Red Dot Trail, starting with the AT section and working your way clockwise around the loop offers a slightly easier climb. 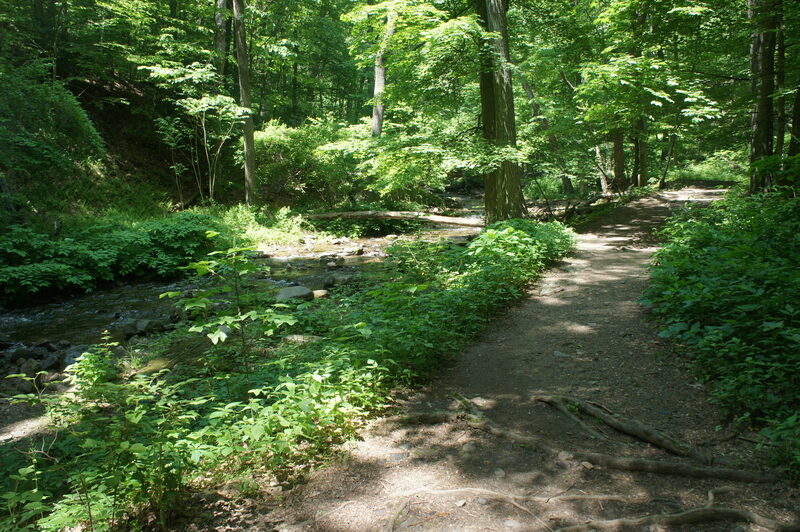 Following the AT, the hike begins in a cool, shady valley graced by pleasant Dunnfield Creek. In about 100 yards, the trail traverses a bridge over the creek and then parallels the stream as it bears northeast. Beautiful chutes and minor cascades accentuate the flowing waters, a far cry from the noisy and uninspiring highway just beyond the trailhead. Bear right at the trail fork at around 4/10 mile. Here the Dunnfield Creek Trail breaks off from the AT as the latter continues its long and lonely meander through New Jersey to New York and beyond. Follow the green and blue blazes as the Dunnfield Creek Trail drops to the banks of the stream at about 0.55 miles, crossing a wooden bridge in a picturesque hollow laced with ferns. Just upstream from the bridge is a small waterfall, no higher than eight feet but a lovely place to stop for a snack before the difficult climb that lies ahead. 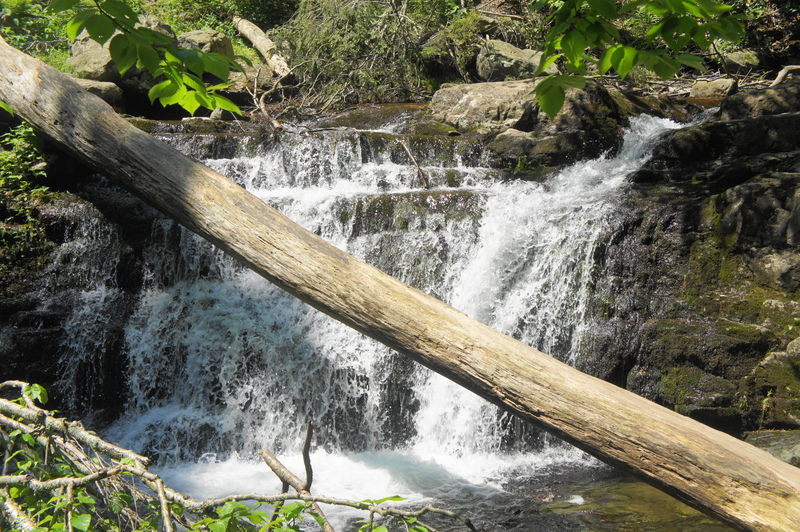 Back on the right bank of the creek, follow the trail as it ascends sharply to a perch overlooking the falls. Continue for about 50 yards until you reach another trail junction. This time bear right on the Blue Dot Trail, which climbs nearly 1,000 feet in the next 1.2 miles. The sharp incline begins almost right away, ascending in and out of patches of sun. After briefly leveling off, the climb picks up again around the hike’s 2/3-mile mark. At about 9/10 mile, the trail narrows slightly and rounds a right-hand bend. The incline gradually lessens thereafter, and hikers can gain some obscured views through the trees to the left. At 1.2 miles, the sharp climb returns but enters a shady thicket that provides some solace on a hot day. 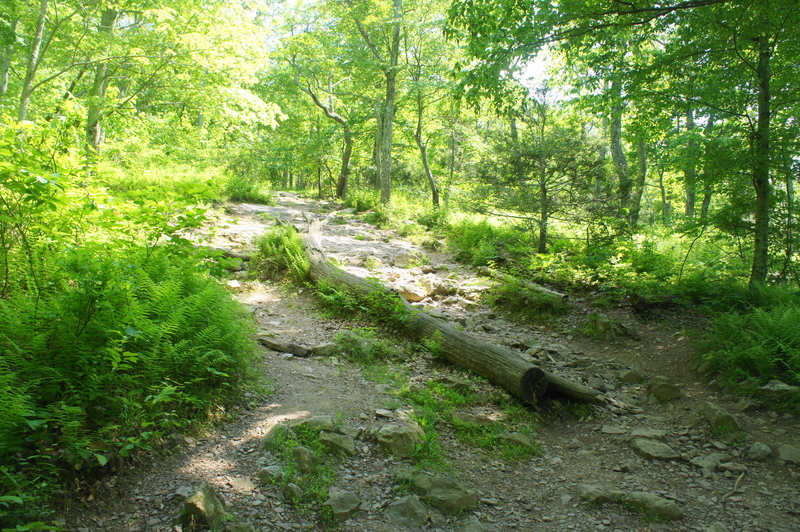 After rounding another right-hand bend, the trail ascends with fits and starts, with one mammoth climb at 1.5 miles. The final burst comes shortly thereafter, and the elevation gain ceases at around 1.8 miles, roughly the high point (1,520’) for the hike. 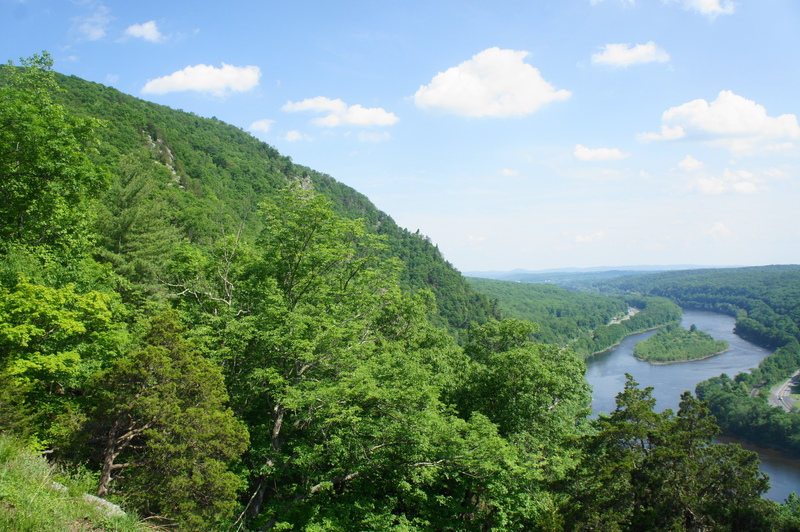 From here, visitors get an excellent bird’s eye view of Delaware Water Gap, with Mount Minsi (1,463’) dominating the opposite slope. Kittatinny Mountain continues west into Pennsylvania, while Godfrey Ridge can be seen to the northwest. This is one of the best mountain views in New Jersey. The viewpoint is roughly the two-thirds point of the hike, with the Red Dot Trail covering the remaining 1.3 miles back to then parking area. Because it offers the shortest climb to the viewpoint, the Red Dot Trail is considerably more crowded than the Blue Dot—but it is also noticeably steeper. Now following the red blazes, head north as the trail weaves through shrubs and passes a second, largely obscured viewpoint at the hike’s 2.2 mile mark. Soon after, the descent begins in earnest, effectively following a boulder field down the mountain. At 2.6 miles, the Red Dot Trail switchbacks down a particularly steep section and then flattens out briefly as it passes through a shady ravine. Continue left as the path passes a grassy knoll at about 2.9 miles and emerge out onto a sunny ridgeline with good views of the Gap. From here hikers can see the slopes of Mount Tammany on the left, as well as Arrow Island and the Delaware River as it bears south between Pennsylvania and New Jersey. Just beyond this overlook, the Red Dot Trail hangs a sharp right and rounds a plump, stony knob. From here it is a steady downhill; hikers can now hear the sounds of Dunnfield Creek ahead. At 3.25 miles, stay right at the trail fork, then stay right again at a second junction around 100 yards later. The final approach involves a set of wooden steps, after which the trail ends at the Dunnfield Creek parking area. This completes the roughly 3.4-mile circuit. Because of the strenuous climb—either on the Blue Dot or Red Dot Trail—hikers are recommended to allot more than the usual 1.5 hours for a 3-mile hike. Most are likely to complete the circuit in 2.5-4 hours in all, including some time at the overlooks. 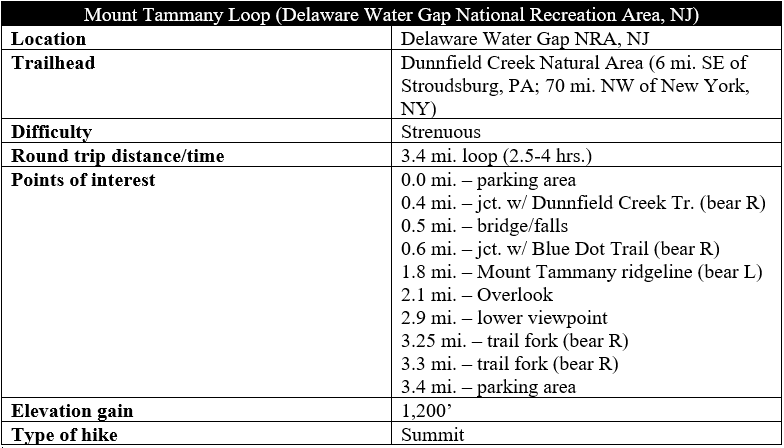 This entry was posted in Delaware Water Gap National Recreation Area, New Jersey, Strenuous Hikes and tagged Appalachian Trail, Blue Dot Trail, Delaware River, Delaware Water Gap, Dunnfield Creek, loop hike, Mount Tammany, New Jersey, Red Dot Trail, waterfall. Bookmark the permalink. The Delaware Water Gap is not to far from me here in Philadelphia. I may have to do this hike! Thanks for sharing.